Home / Record Cleaners / Preservatives / LAST Record Preservative – 2 Oz. 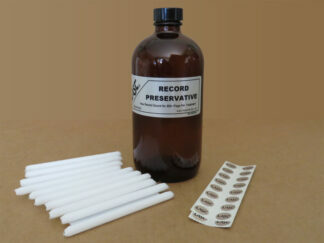 LAST Record Preservative – 2 Oz. Industry-acclaimed treatment that prevents the development of annoying pops and clicks and maintains “as new” condition for 200 plays or more. LAST Record Preservative has been universally applauded by the super-critical reviewers and editors of audio publications. New records treated with LAST Record Preservative and kept clean can be played 100’s of times without discernible wear–allowing them to be in pristine condition for future generations. LAST Record Preservative chemically enhances the molecular stability, and therefore the cohesiveness of the groove surface so that it completely resists the damaging effects of stylus shock waves. Related product: LAST Record Preservative 2oz in the original leatherette box. The 30-second treatment affects the vinyl to a depth of about ten molecular layers and becomes part of the groove wall. There are no surface residues that can be picked up by the stylus. In fact, overuse is harmless. Treats 85-90 vinyl records (both sides). LAST Record Preservative – 16 Oz. LAST Power Cleaner – 4 Oz.